An essential part of building any sort of chopper, bobber, cafe racer, brat bike, or rat rod is getting rid of all the unnecessary items. These days I just grab my wire snips and start trimming away with no regard for common sense and caution – but if you are working with your first wiring loom I’m going to try and give you some guidance right now. 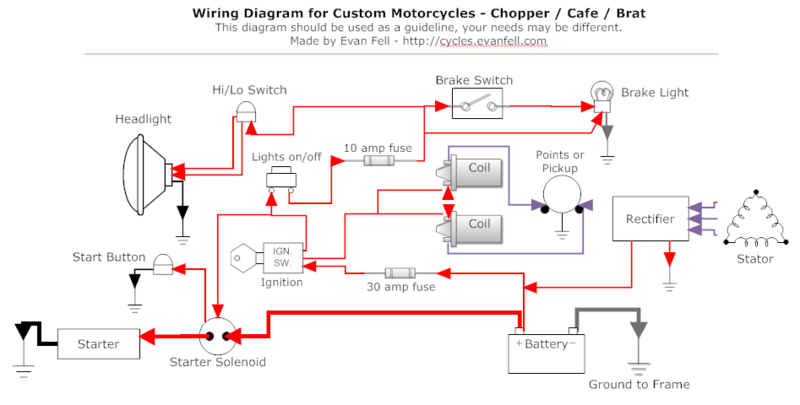 The above diagram is from a Honda CB750 Custom dual cam bike. Lots of 70’s and 80’s bikes will look the same, especially the four cylinders. If you are trying to build a stripped down bike there is a lot going on that you don’t need. A lot of the controls can be removed, blinkers, gauges and indicators, relays and switches. It doesn’t take a whole lot of wiring to keep a bike on the road, especially if you don’t want to cater to the law word for word. By trimming down the wiring you’ll be saving complexity, saving weight, and cleaning up the look of your bike. Below is a generic wiring diagram I whipped up that can be used as a guideline. I tried not to tailor it specifically to any particular model of bike, and I tried to make it as easy to understand as possible – but really any 70’s and early 80’s model bike with carbs will adapt to this diagram quite well. 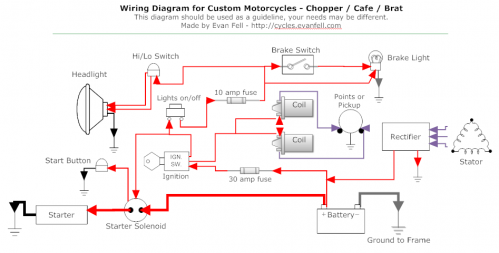 This diagram is setup to run a headlight and brake light, keep your battery charged, and have a keyed ignition. Personally, I sometimes strip my bikes even further, but I’ll mention that further down the page. When working on your existing wiring loom it is best not to just start cutting wildly (like I do!) but to be very careful. Inside your headlight is where much of the wiring converges, so is a good place to start. Remove your headlight and start trimming back the sheaths. Slice back the sheaths of the wiring loom as far as possible to expose the wires inside. If this is your first electronics exploration, start with something easier. Pick a fixed item you’d like to remove and trace the wires. An easy starting point is the blinkers. 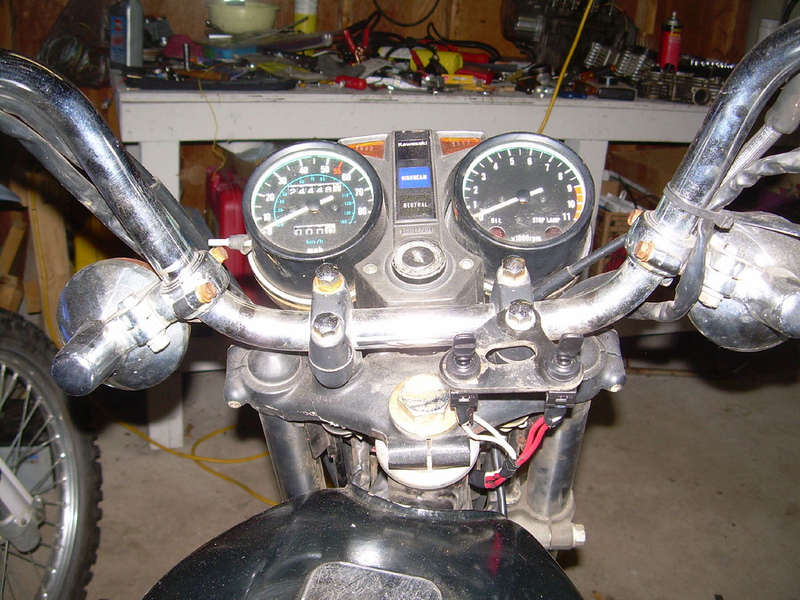 To remove your blinkers, unbolt them one at a time, then trace the wires through the cut open sheath. The grounding wire will most likely be shared with your headlight and gauges depending on the bike, so don’t trace the black wire, just unplug it. But, you should be able to follow the positive lead from each blinker all the way to the flasher relay which will be near the battery and rectifier under the seat. You can remove all of this wiring, the relay, and of course the blinkers. It will do everything you need. 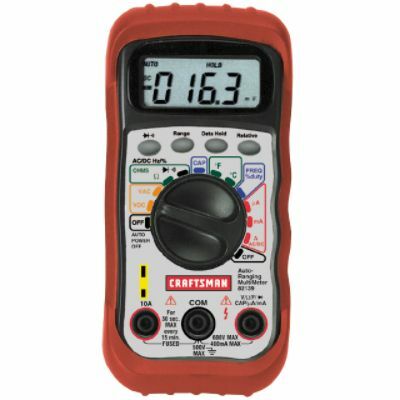 Or if you are a stickler for high quality tools like I am you can spring for something like a Craftsman Multimeter for around $50-60. This is what I use – though I must state, I only use 10% of what this device is capable of. Or sometimes I’ll just stick them to the headstock, or under the seat so they are out of the way completely. The above KZ440 I didn’t remove a lot from. In this picture I had one switch overriding the keyed ignition, and another activating the starter. It was kind of a weird setup, but the only photo I have handy. When removing things you always want to make sure they are either not being utilized or serve no essential purpose. 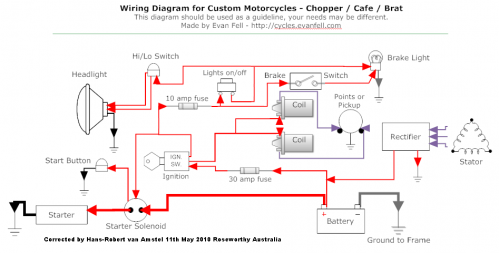 If you have the bike running and you’re watching voltage on a particular item (for example: a neutral switch), you’ll understand when it’s being used and when it isn’t and this will help you make a decision of whether or not it should be cut out. My general goal isn’t to be legal. You know what I’m after. There is a lot more involved with doing a clean wiring trim than what I’ve mentioned here, but hopefully this helps push you in the right direction. If you have questions, please ask them either here in the comments or on my new Motorcycle Repair Forums. I do my best to help out everyone who posts. I won’t explain the above right here right now – but if you’re looking to go as low profile as possible and have questions, please let me know. On many bikes you’ll need to introduce a capacitor or two and possibly a particular regulator unit. of precious experience on the topic of unexpected feelings. Is your brake light switch functioning correctly or installed? what kind of bike? “Every action of our lives touches on. It is not known what prompted officials to drain that specific septic tank looking for Noah’s body. Don, I’m doing the very same thing. Retiring in a few years with plans to rebuild/cafe some old bikes to keep me active. How’s your rd project coming? I have a DS7 250, 1971.
of its user. To attain this level in the blood, most people must supplement with an additional 4000 to 5000 IU of vitamin D3. evanfell.com has potential, you can make your blog go viral easily using one tricky method. Great post and helpful diagrams. 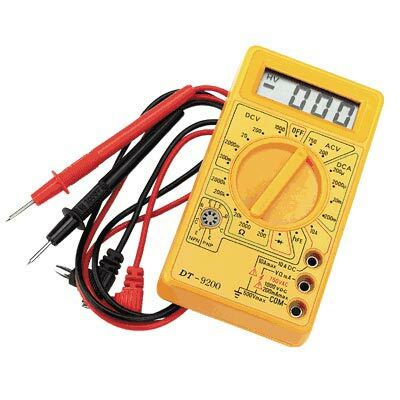 Has anyone experience with connecting the indicator lights also on the latest diagram (with battery)? promoções e conteúdos exclusivos do Dieta e Saúde e seus parceiros. I have a 1978 honda cb 750 k8 ive been interested n doing the same with my project cafe racer its my first project as a full time single parent of 4 i have very lil time to look into this my self an studie up on it if you could point me the right direction with this veery much appricated every lil bit of help is like takeing a mile for me … an ne info on hooking up a rec/reg n 1 with cdi ign boxes would b much help as well thank u…. lights to the bike as anybody got a diagram for this thanks, Frank. And also if you’re planning to obtain your hands on one, be sure to look into our checklist of carriers that are offering up the phone for pre-order today (obviously T-Mobile is included). Got two pickup coil with 2 wires each. I have a 1977 Honda4 800.6 I am putting a motor on a go-kart eliminating just about all wiring got ahead of myself I have two coils on it one with the yellow wire and a white and black wire the other one has a blue wire and a white and black wire which ones are the ground and where do I plug the hot wires into . I have the complete frame of the 1977 Honda 4 i believe it is 750I was told it was $800 but its only 750 cc .it has good gas tank fenders Forks shocks tires rims brakes the wiring that is cut in a million pieces I just need the motor and exhaust chain and rear sprocketclean body no title good seat. Ifsomebody could help me out on how to wire up the coils after bypassing the wiring harness you can have it. Just putting this out here. I’m in need of a fuel tank that will fit my 1979 Suzuki gs 1000! If anyone reading this knows where I can find one please get back to me at drag_n_fly1@hotmail.com. Need help in wiring up 82 gs1100 headlight. The three yellow wire coming off of the stator. I would also like to only run a speedo and delete everything else for a clean look. Any help, I could surely use thanks ever so much. Wiring a ’74 CB125, hoping to go battery-less, use 12v accessories (headlight/tail light/ neutral light…but kind of indifferent on the neutral light). It is kickstart only, but does have an ignition, which I am keeping. I am very new to wiring, but have read that on this particular bike, you can run a capacitor in place of the battery (which was 6v stock). Several people who have done this said they ditched the regulator and just had a cheap radio shack rectifier (which I purchased). One person also said only a 15 amp fuse was needed. Might there be a diagram, video, or step-by-step that could walk me through this thing? Thanks! Could I use a Honda 750 double cdi in my triumph 750? I have a xv 400 Virago that I bought in pieces. Will let you know How I progress if you are interested. Yeah man same here, did you ever figure it out. I’m trying to build a harness for a 1983 cb650 and I can get It to fire, I think I may not have my igniter box or coils wired correctly. What I am going to try to do is take the ignition switch out and put in a new ignition switch out of a 1980 Suzuki GS750. I want to wire it up like a car, where you use the key to crank over the engine and bypass the start button. I have four wires coming out of the current ignition switch (red, brown, orange, and gray) and I’m not 100% sure which is what, I don’t have a battery in it yet to test this stuff out. The ignition switch I purchased is marine quality with five posts B, G, M, L, and S. With no schematic on the packaging I am assuming it stands for Battery, Ground, Magneto, Lights and Starter. Is there anyone out there that can assist me with how to wire this bad boy up? 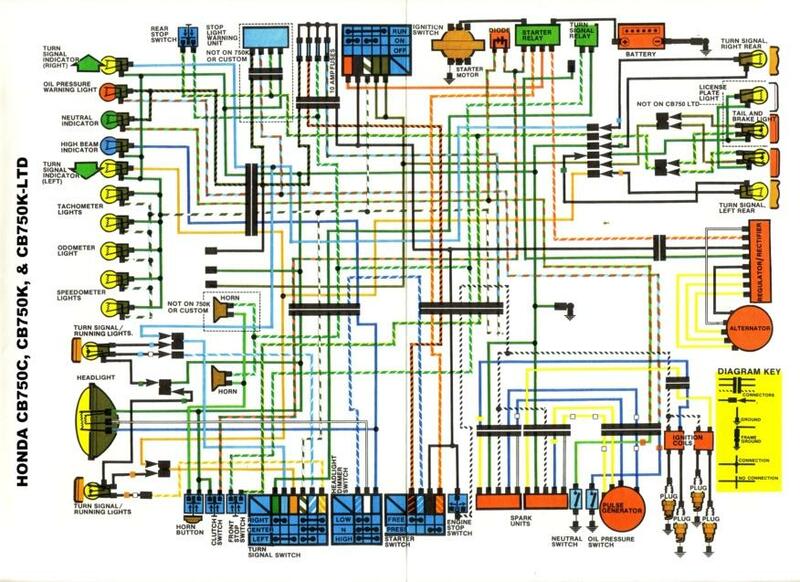 I’d like to do bare minimum simplified electronics on my 1980’s Yamaha XS250. Hoping it will make it more reliable and easier to maintain. Hey. I’m working on a 1973 CB450 kick start only – headlight and taillight/brake light only. Do you have any diagrams for this setup? I plan on either a small battery or no battery and ripping out the starter. "What blue-region white liberals actually want is for the government to disarm the dangerous urban minorities that threaten their children’s safety…"You're saying these "blue-region white liberals" are not smart enough to competently read crime statistics, and discern that 83% of white murder victims are killed by whites? AsplÃ¶vens nuvarande arena Ã¤r under all kritik….. finns div 3-klubbar som har mkt bÃ¤ttre ar..nre.o… mÃ¥ste hÃ¤nda nÃ¥got dÃ¤r, och det inom 1-2 Ã¥r……..
Je pense que Ã§a doit Ãªtre un « bon » film mais la bande n’est pas top ( en fait le rÃ©sumÃ© est tentant)Si je le vois j’ai peur d’Ãªtre dÃ©Ã§ue, Conseillez-moiiiiiii !!!N!!!!!!!!!!!!!!!!!!!!!!!!!!!!! !ous maintenons notre conseil : oui c’est un bon film et non, tu ne seras pas dÃ©Ã§ue ! Oh Greta. This made me sob. Fantastic letter & I hope you are doing well & enjoying life. Good for you for not holding onto that anger!Thanks for sharing. Good stuff. Building a 81 hardtail Honda cm400. Very stripped down. Thanks!! Hi Evan, I have a 1971 CB350 stripped down cafe style and sans the starter. Looking to do the basic wiring with no battery. Also thinking about ditching some older things like points, etc. Is electronic ignition the way to go if still doing kick start? I actually have a really nice full harness but may need to go with something else if I’m starting from scratch. 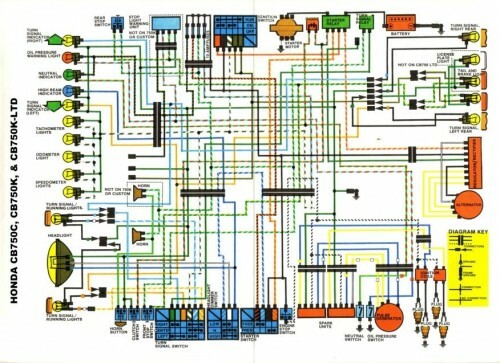 So if I do that and have all the original stock parts what is the parts list for doing the kick start only diagram? I have a 1988 yamaha virago 1100cc.I want my wiring as simple as i can make it. also, what do i do about the igniter? any help would be appreaciated. thanks. Is it possible to get a custom wiring diagram for a 1982 kz1000j ?